Beyond the Fringes: Pass the tarragon, please. Day four of take out burgers and subs? Instead take ten minutes to poach some chicken and prepare tarragon sauce OR enjoy a tarragon crusted scallop or two. 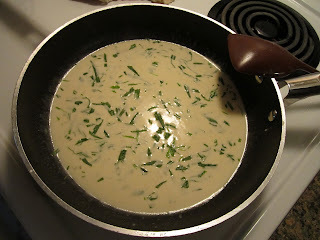 Add 1/2 cup creme fraiche; simmer 'til thickened. Adjust quantity as needed. Add 1/4 cup chopped fresh tarragon. Season with fresh ground black pepper, if desired. Yes, get yourselves a pepper mill! Serve with a simple side- rice, orzo, etc. Saute: 1 tbsp butter, 1 clove garlic. Add 1/4 cup chopped tarragon. Can cool for future use. Top with bread crumb mixture. Finish in a 400C oven for 5 minutes.